During a week of protests and marches against patriarchy and skewed politics, it’s good timing that a band with liberal ideals and an explosive expression also unleash their progressive thoughts on a record. Like a poster campaign during one of the demonstrations that was paraded with the words: “Trump: We shall Overcomb”, Cherry Glazerr mix their views on equality with a brazen humour and youthful charm that will make it both entertaining in an relatable manner and empowering. As the appropriate album title of Apocalipstick suggests, they are a feminist-minded trio veraciously ready to explode at any moment. 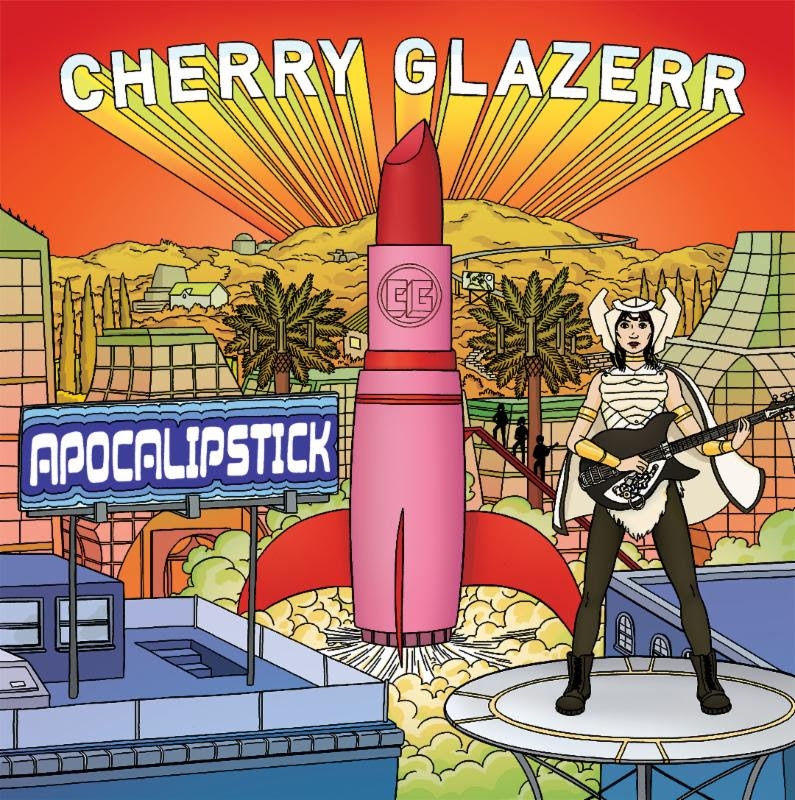 A lot has happened in the three years between Cherry Glazerr’s debut album Haxel Princess and their new album Apocalipstick. Not only have the band elevated record label promotion from L.A’s Burger Records to Indiana’s Secretly Canadian but the band have completely reshaped with now only one surviving member, lead vocalist and founder Clementine Creevy. This explains their transition musically from slacker garage rock comparable with Hinds and Chastity Belt to roaring grunge punk mixed with subtle elements of new wave, to make them a mix of Metric and Wolf Alice – with new members Sasami Ashworth (Synths) and Tabor Allen (drums) responsible for this. Creevy sung on the predecessor about grilled cheese sandwiches, sneaky cigarettes, love sweat and poo jokes – the vocabulary expected of a teenage college student who’s music is aimed at teenage college students. At the age of 19, Creevy has maintained her down-to-earth personality but expanded upon her thought process. There is still that sense of explicit griminess that rebels against the stereotypical clean and health-conscious image of women, as proven by the words: “We wear our underpants three days in a row” (‘Trash People’) and “Baked into pizzas, sometimes steak fajitas.” (‘Humble Pro’) as well as Clemetine Creevy’s bedraggled appearance in their music videos such as ‘Nuclear Bomb’. Creevy’s goal is to point out that “nothing is all pure and nothing is all dirty” in both sexes. However, the most important form of mature progression is heard in lead single ‘Told You I’d be With The Guys‘. A song that outlines her wish for female solidarity and the importance this has on creating an environment of gender equilibrium: “I thought I lost my pack, where are my ladies?” At such a young age, it’s an amazingly precocious analysis and proof that much of the millennial generation is clued-in and ready to bite in the name of defiance.